This essay was a concerted attempt to write in the "adventure" style of Muir's stories, which I'd been reading for weeks. Every time my imitation got too close I would remember, "John Muir hated writing!" But like he, I endured. 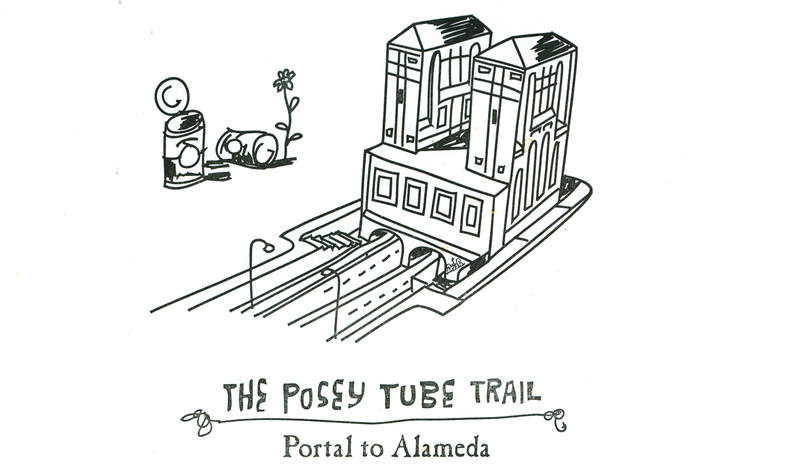 It was on my first errand towards creating a project about John Muir that I rode into the depths of the Alameda Tunnel, also known as the questionably-named Posey Tube Trail—a place that forced me to recall the essays of Mr. Muir's that I had been reading all the previous week, self-told adventures in which conditions favored only a true mountaineer! I had just received official word that my project about Muir's first journey from Oakland to Yosemite had been approved by the Oakland Museum of California. Prior to making any journey, I decided to create a set of notebooks/plant specimen herbariums and notebooks with a letterpress printer on the island of Alameda. As avid an urban bicyclist as Muir was a mountaineer, I had still never made the channel-subverting Alameda Tunnel part of my knowledge. It was with a Muir-charged exuberance that I approached the challenge. My first attempt to enter was to be of little gain—a chain-linked closing to what, in previous times, had been a stately civic invitation. Undeterred, I saw that the opposite side allowed access and I swiftly made my way. Upon descending the stairs and accepting that I must go against all wrong-way signage, I found the "trail" to be not much wider than the handlebars of my bike. To my left was a tile clad tunnel wall. Rounding up and inwards towards my head, this thick wall was coated in an even grime from endless brake pads, exhaust pipes, and human disappointments. The shoulders of previous cyclists marked their shakier moments in a steady pattern of arced smears. On my right side was a much-abused handrail that separated the elevated path from the roadway—a ferocious, opposite stream of cars, buses, and container trucks that thundered through what was a true choke point. A mass of different appointments and necessities and intents all focused into one menacing tube. The railing happened to be at the same height that my hand met my handlebar. Knuckle awareness! Considering my physics, I was sure that if I were to hit the rail, I would be wrenched violently over the side and would drop the ten feet down to join the desperate stream of steel and rage. A calamity I did not wish to invite! The path itself was a series of cement pavings, each lazily fitted to the next in terms of height and orientation, cracked, wobbly, and pitted, causing a rattled drumbeat to play beneath my wheels. I thought of how I was subverting a waterway, one that John Muir himself may have encountered, and how very opposite was my view. Everything here was against nature. Brutally convenient, anxious, manmade. Natural wonders erased and replaced. The incline of the tunnel made for a speed that was on the wrong side of "safety." I became alive in the challenge. Steady and sure...intent, like the aggrandized adventures told of by Muir. But the tunnel was long and the adventure spirit gave way to the how-much-longer spirit. And musing became muster. When I reached the golden-lit Alameda portal it was with relief...and some biking pride. As I walked up the stairs I saw two empty cans of Campbell’s soup and thought of someone encamped under the stars with their simple provisions and a contentment that John Muir himself might have shared. I knew I was wrong.